WAKISO –Police in Bulenga has arrested a man suspected of Kidnapping a child and killing his girlfriend. 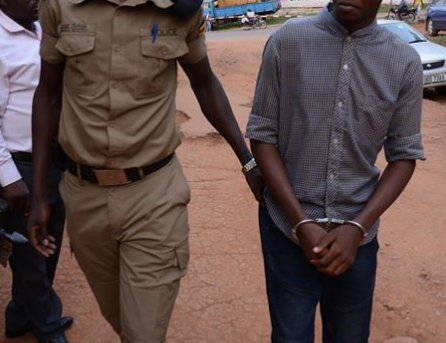 Deo Mukisa, a resident of Kireka Bbira Nakabugo Parish Wakiso district was arrested in Kampala by security officers for allegedly kidnapping a four-year-old Elvis Kibule and murdering girlfriend whose name was not revealed. According to the Kampala Metropolitan Deputy Spokesperson Luke Owoyesigire, “Kibule was reported kidnapped on Thursday 24/01/2019 and Police investigations led to the arrest of Mukisa on Wednesday 30. “Yesterday the police was able to recover the body that had been dumped in a swamp around Kireka Bbira. The body was picked and taken to Mulago for Postmortem,” he said. In a statement, Oweyesigire said that the suspect confessed to the kidnap and murder cases. He added that later the suspect also led police officers to the scene where he had dumped the body of his girlfriend whom he had killed earlier. He confessed to the murder by poisoning and the deceased had been reported missing at Central Police Station in Kampala a few days ago.